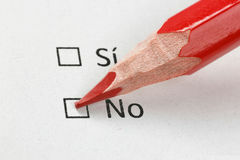 161 yes spanish stock images are available royalty-free. Should I say yes or no. 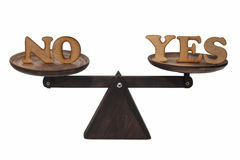 Decide between yes and no - Spanish I think I prefer to say yes. 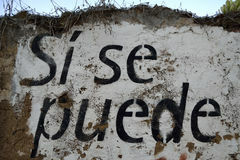 Decide between yes and no - Spanish Spanish text painted on a wall: si se puede. Yes it is possible Rock n roll. Funny spanish woman in denim overalls, looking at c. Amera with rock sing. Studio shot, on gray background Thoughtful young woman making a YES choice. 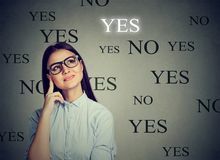 Thoughtful woman making a YES choice Should I say yes or no. 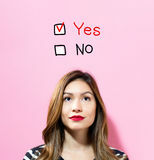 Decide between yes and no - English Yes No text with young woman. 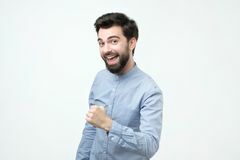 On a pink background Satisfied businessman giving a YES. 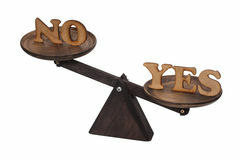 I think I prefer to say yes. 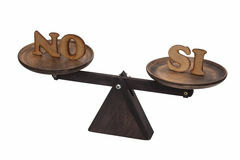 Decide between yes and no - English Spanish police about catalan referendum. 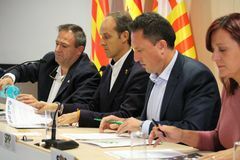 BARCELONA/SPAIN - 28 SEPTEMBER 2017: Representatives of five unions of Spanish national police giving a statement to the Spanish police about catalan referendum. BARCELONA/SPAIN - 28 SEPTEMBER 2017: Representatives of five unions of Spanish national police giving a statement to the Heart with the Catalan and the Spanish flags. 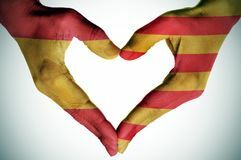 The hands of a young woman forming a heart patterned with the flags of Spain and Catalonia Cracked eggshell with Catalan and Spanish flags. 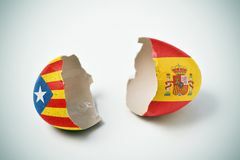 The two halves of a cracked eggshell, one patterned with the flag of Catalonia and the other one patterned with Catalan pro-independence flag and Spanish flag. 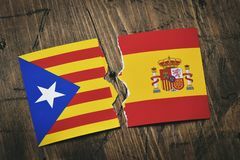 The Estelada, the Catalan pro-independence flag and the flag of Spain, broken on a rusitc wooden surface Catalan pro-independence flag and Spanish flag. 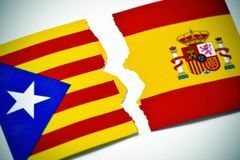 The Estelada, the Catalan pro-independence flag, and the flag of Spain, broken on a rustic wooden surface Catalan pro-independence flag and Spanish flag. 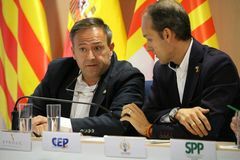 The Estelada, the Catalan pro-independence flag, and the flag of Spain, broken on an off-white background Catalan pro-independence flag and Spanish flag. 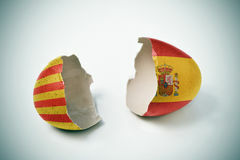 The two halves of a cracked eggshell, one patterned with the Estelada, the Catalan pro-independence flag and the Catalan pro-independence flag and Spanish flag. 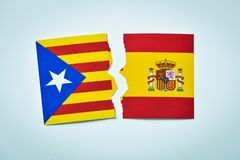 The Estelada, the Catalan pro-independence flag and the flag of Spain, broken on an off-white background, with a I think I prefer to say no. 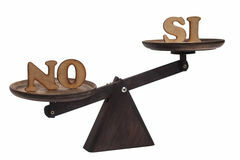 Decide between yes and no - Spanish Successful emotional young hispanic man with dark hair screaming Yes and raising clenched fist. 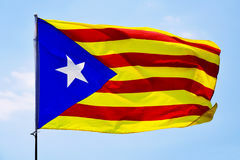 Triumph, victory, winning and celebration concept Si Yes for the referendum flag banner Barcelona Referendum. 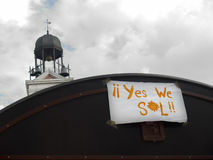 Barcelona, Spain - Nov 12, 2017: Si Yes for the referendum flag banner placard on the Barcelonian Yes we sol (sun) sign posted at the Sun square (pl. MADRID; SPAIN - MAY 20: Popular demonstration against political class on May 20; 2011 at Madrid; Spain. Claim Couple walking in narrow street. Young couple walking in narrow street shopping and talking and yes I think I prefer to say no. 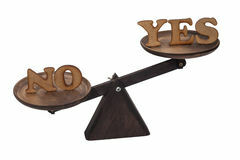 Decide between yes and no - English Girona in Spain. Capital Girona of Spanish province Catalonia Girona in Spain. 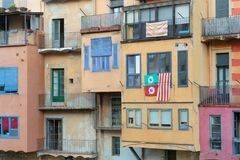 Capital Girona of Spanish province Catalonia with flags for the referendum Girona in Spain. Capital Girona of Spanish province Catalonia Flamenco girl. Wiht big yes RUPIT, CATALONIA, SPAIN - SEPTEMBER 2017. Town inhabitants demo. Nstrate they will vote YES for Catalunya`s independence. 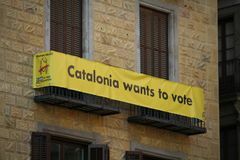 Catalonia will hold an independence Catalan referendum propaganda. 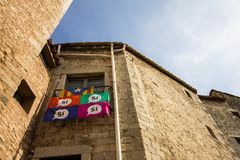 BARCELONA/SPAIN - 28 SEPTEMBER 2017: Symbols for voting at the referendum for the independence of Catalonia, that should take Costa Brava 021. 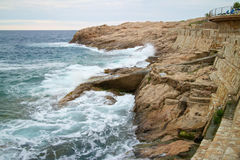 Rocky coast at the Spanish Costa Brava, Catalonia, with waves crashing in Independence symbols in Catalonia, Spain. 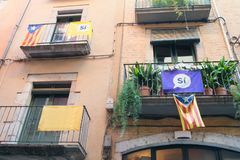 Barcelona, Spain - May 5, 2018: Balcony with Catalonian flag and Si Yes poster, a reference to the controversial RUPIT, CATALONIA, SPAIN - SEPTEMBER 2017. Town inhabitants demo. Nstrate they will vote YES for Catalunya`s independence. 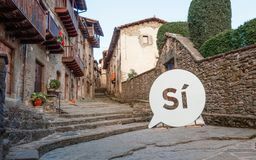 Catalonia will hold an independence RUPIT, CATALONIA, SPAIN - SEPTEMBER 2017. Town inhabitants demo. Nstrate they will vote YES for Catalunya`s independence. 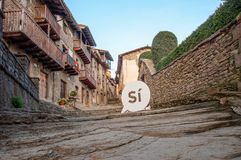 Catalonia will hold an independence RUPIT, CATALONIA, SPAIN - SEPTEMBER 2017. Town inhabitants demo. 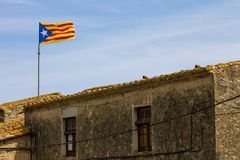 Nstrate they will vote YES for Catalunya`s independence. 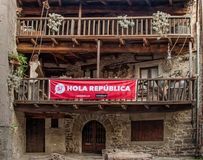 Catalonia will hold an independence RUPIT, CATALONIA, SPAIN - SEPTEMBER 2017. Town inhabitants demo. 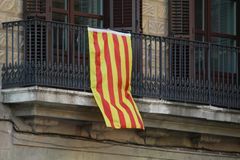 Nstrate they will vote YES for Catalunya`s independence. Catalonia will hold an independence Catalan President Puigdemont receiving population that will help with referendum. 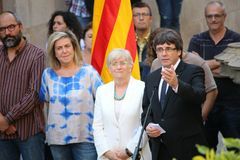 BARCELONA/SPAIN - 28 SEPTEMBER 2017: Catalan president Carles Puigdemont GIRONA, CATALONIA, SPAIN - AUGUST 2017. 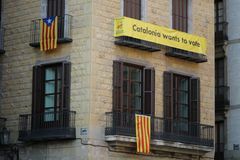 Town inhabitants demonstrate they will vote YES for Catalunya`s independence. Despite anger in Madrid, Catalonia will GIRONA, CATALONIA, SPAIN - AUGUST 2017. 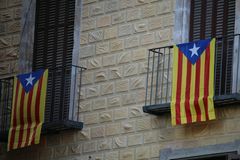 Town inhabitants demonstrate they will vote YES for Catalunya`s independence. 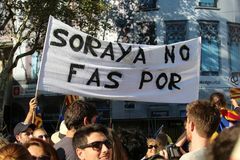 Despite anger in Madrid, Catalonia will GIRONA, CATALONIA, SPAIN - AUGUST 2017. 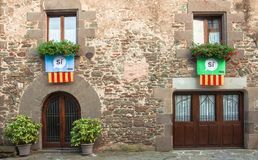 Town inhabitants demonstrate they will vote YES for Catalunya`s independence. Despite anger in Madrid, Catalonia will GIRONA, CATALONIA, SPAIN - AUGUST 2017. 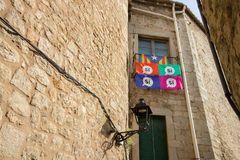 Town inhabitants demonstrate they will vote YES for Catalunya`s independence. Despite anger in Madrid, Catalonia will Catalan referendum propaganda. 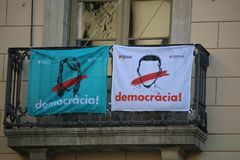 BARCELONA/SPAIN - 28 SEPTEMBER 2017: Symbols for voting at the referendum for the independence of Catalonia, that should take Catalan referendum propaganda. 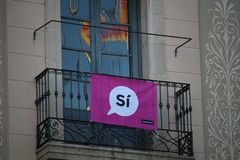 BARCELONA/SPAIN - 28 SEPTEMBER 2017: Symbols for voting at the referendum for the independence of Catalonia, that should take Catalan referendum propaganda. 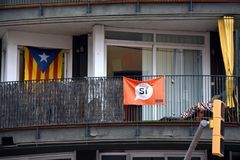 BARCELONA/SPAIN - 28 SEPTEMBER 2017: Symbols for voting at the referendum for the independence of Catalonia, that should take Catalan referendum propaganda. 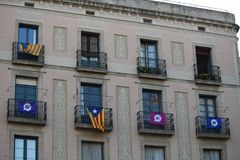 BARCELONA/SPAIN - 28 SEPTEMBER 2017: Symbols for voting at the referendum for the independence of Catalonia, that should take Catalan referendum propaganda. 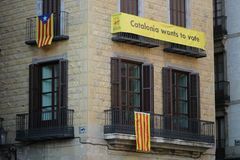 BARCELONA/SPAIN - 28 SEPTEMBER 2017: Symbols for voting at the referendum for the independence of Catalonia, that should take Catalan referendum propaganda. BARCELONA/SPAIN - 28 SEPTEMBER 2017: Symbols for voting at the referendum for the independence of Catalonia, that should take Catalan referendum propaganda. 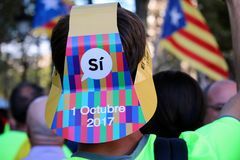 BARCELONA/SPAIN - 28 SEPTEMBER 2017: Symbols for voting at the referendum for the independence of Catalonia, that should take Catalan President Puigdemont receiving population that will help with referendum. 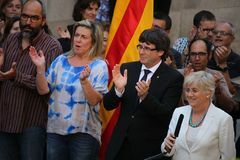 BARCELONA/SPAIN - 28 SEPTEMBER 2017: Catalan president Carles Puigdemont Catalan President Puigdemont receiving population that will help with referendum. 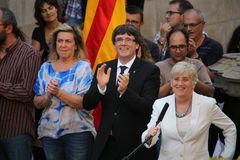 BARCELONA/SPAIN - 28 SEPTEMBER 2017: Catalan president Carles Puigdemont Catalan President Puigdemont receiving population that will help with referendum. 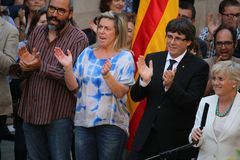 BARCELONA/SPAIN - 28 SEPTEMBER 2017: Catalan president Carles Puigdemont Catalan symbols at Diada independence manifestation. BARCELONA/SPAIN - 11 SEPTEMBER 2017: People participating with Catalan secessionist messages as `Vote yes at Catalan symbols at Diada independence manifestation. 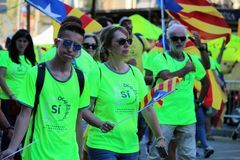 BARCELONA/SPAIN - 11 SEPTEMBER 2017: Message to vote `Yes` on Catalan secessionist referendum that will take Catalan symbols at Diada independence manifestation. BARCELONA/SPAIN - 11 SEPTEMBER 2017: People participating at the Diada, the national day of Catalonia with The estelada, the catalan pro-independence flag. Waving on the blue sky Young Boy. 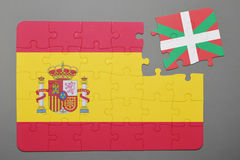 Outside Puzzle with national flag of Spain and Basque Country piece detached. 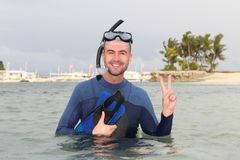 Concept Diver giving a peace sign after an immersion. Young Boy. 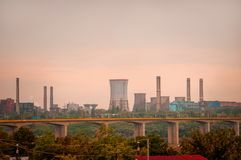 Outside Young attractive girl shows like gesture, satisfied with something, wearing white shirt and scarf, standing over pink background. 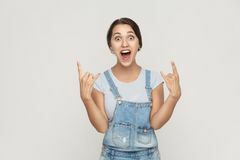 Portrait of happy teenager Portrait of amazed beautiful young woman in white shirt and brown apron with makeup and brunette hair standing with rock gesture. And looking at camera with Portrait of two happy beautiful brunette best friends in casual style standing and having fun together and celebraiting their. Victory. 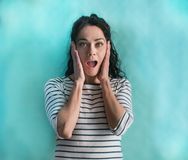 indoor studio shot Portrait of satisfied beautiful attractive brunette woman in casual striped orange shirt with makeup and curly hairstyle standing. Toothy smile and thumbs up Hand set with the flag of Spain. 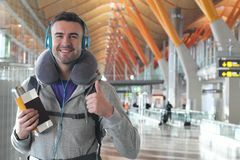 A set of hands with different gestures wrapped in the flag of Spain The cutest traveler in the world. 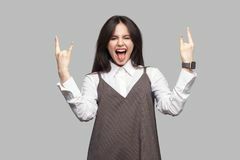 Beautiful hispanic woman wearing stripes sweater celebrating crazy and amazed for success with arms raised and open eyes screaming. Excited. Winner concept Portrait of beautiful young woman in white shirt and brown apron with makeup and brunette hair standing and looking at camera with. 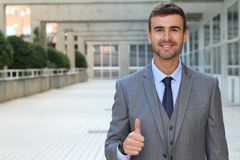 Ok sign gesture. 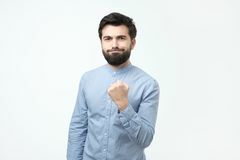 indoor Portrait of very excited young man, celebrating victory with raised fist. I have done it. 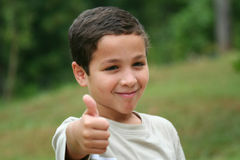 Achieve success in the goal concept Young man in blue t-shirt showing OK sign in secret. 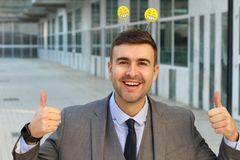 Caucasian male showing okay gesture with his fingers Businessman with smiley faces antennas. 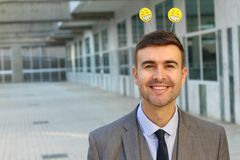 Blonde woman with a black coat saying Ok. Isolated on white background Businessman smiling with smiley headwear. 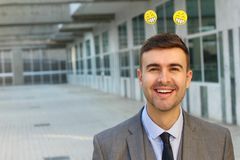 Businessman smiling with smiley headwear. 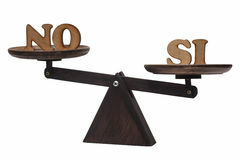 No option. 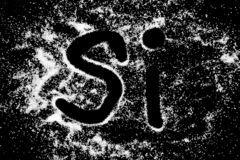 With red pensil Yes word symbol drawing by finger on white salt powder on black background. 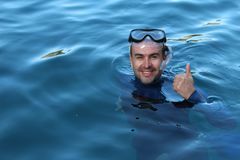 Yes word in spanish language Si symbol drawing by finger on white snow salt powder on Diver giving a thumbs up after an immersion. 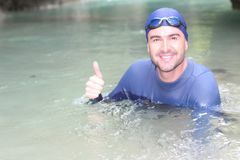 Swimmer in the water giving thumbs up. Professional construction industry driver giving thumbs up. Joyful surfer giving a thumbs up. 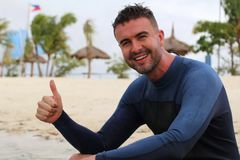 Joyful surfer giving a thumbs up.